Manufacturing drugs creates a wide variety of potential problems, ranging from the addictive and destructive qualities of the drugs manufactured to the literal destruction that can often be caused by the dangerous manufacturing process itself. Usually this crime involves methamphetamine, however it can be charged against those attempting to manufacture any controlled substance. Manufacturing controlled substances is a criminal offense under California Health & Safety Code Section 11379.6 HSC that can lead to a felony conviction and a lengthy prison sentence for someone convicted. AND the defendant knew of the substance’s nature or character as a controlled substance. The chemical extraction or independent chemical synthesis may be done either directly or indirectly. AND the defendant knew that the chemical was going to be used in the manufacture of a controlled substance. A defendant who knowingly provided a place to manufacture drugs can be prosecuted for aiding and abetting California Health & Safety Code Section 11379.6 HSC. A man decides to operate a meth lab out of his tool shed. He buys the necessary tools and chemicals and begins to work in his makeshift laboratory. However, the man uses too much of a certain chemical and causes a massive explosion that he just barely survives. The man could be charged with manufacturing a controlled substance in violation of California Health & Safety Code Section 11379.6 HSC. In another example, a man owns a commercial laboratory and is approached by drug dealers who pay him to “rent” his lab to manufacture their own controlled substances. The man agrees and allows this use of his property. Even though the man is not directly involved in the manufacture of drugs, he could be prosecuted under California Health & Safety Code Section 11379.6 HSC because he knowingly allowed his property to be used to manufacture controlled substances. If the defendant was only involved in the preparation stage of manufacturing drugs, he would not be guilty of this offense. Thus, if he only bought the necessary materials to make meth, but then changed his mind and did not synthesize these chemicals, he would not be criminally liable under the statute. Manufacturing controlled substances is a felony offense that is punishable by up to seven years in prison. 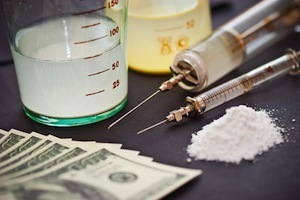 If the drug involved was PCP, methamphetamines or GHB, the defendant could be sentenced to an additional three years in prison if the drug exceeded three gallons or one pound, an additional five years if the substance exceeded 10 gallons or three pounds, an additional 10 years in the substance exceeded 25 gallons or 10 pounds and an additional 15 years if the substance exceeded 105 gallons or 44 pounds. Manufacturing a controlled substance is a serious felony offense that can carry lengthy prison sentences for those convicted. If you or a loved one have been charged with this offense it is very important that you consult with a Los Angeles Criminal Defense Attorney immediately. Los Angeles Criminal Defense Lawyer Michael Kraut is a former Deputy District Attorney with over 14 years of prosecutorial experience who is highly skilled at defending individuals charged with offenses like this. For more information about manufacturing controlled substances, and to schedule your free consultation, contact Los Angeles Criminal Defense Lawyer Michael Kraut at the Kraut Law Group located at 6255 Sunset Boulevard, Suite 1480, Los Angeles, CA 90028. Mr. Kraut can be reached 24/7 at 888-334-6344 or 323-464-6453.